For perspective, this is where the new Dominick's at Sheridan and Foster is located. I think this photo was taken from the roof of Brill's restaurant on the southwest corner of Foster and Sheridan.In addition, located immediately to the north of the Sands property was the Tides Motel. It's amazing, the large number of hotels that used to be along this stretch, when the north side was more of a vacation destination. 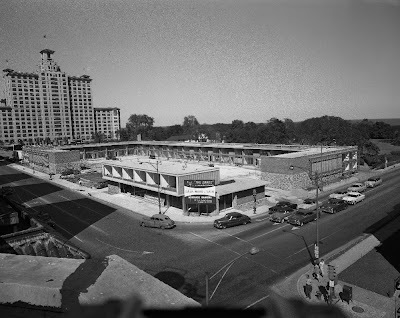 Does anybody remember Frank and Maries across from the Edgewater Beach Hotel. I've not heard of it. Was it a restaurant or a bar? What was it like? It was a Restaurant, I beleive they were Greek. It was a very nice place.I Worked there in the Sixties. Adding to my last comments: I was a bus boy at the restaurant. Johnnie Weissmuller (Tarzan) would come in when he stayed at the Edgewater Beach Hotel. I grew up in Uptown, Goudy School, Stockton School and Senn High School. You've no doubt seen a lot of changes to the neighborhood! If you have any pictures or stories you'd like to share, of anything, we'd love to see them. I lived ther from 1954 thru 1972When I was drafted in the army and returned in 1981 I worked for the Illinois national guard at Broadway Ave Armory and the Chicago Ave Armory, until 1988. From this picture, there doesn't appear to be room for the Tides Motel between the north side of the Sands and the Edgewater Beach. I watched the EBH being demolished from the Tides. I was very young at the time but I could swear that the building on the southwest corner of the property in the picture looks alot like what became the Tides Motel. I would love to get a picture of the Tides and any of its history, beyond the fact that it had a "mob" reputation in is later years. When was it demolished? What's there now? Does ANYONE know the name and history of the movie "house" just to the north of the EBH? The original "Nutty Professor" debuted there in the summer of '63 or '64. I understand Jerry Lewis made an appearance. I remember Frank and Maries very well. My mother had a boyfriend that took her and us there all the time. I certainly remember having dinner there (very elegant), my younger brother was with us. I remember them draping a large napkin over my coat that was on the back of my chair. My brother ordered a Coke and they brought it to him in a standing champagne cooler! We thought it was one of the most elegant places we ever went. Great memories.